In the run-up to the 2016 general election, Tufts University launched JumboVote as a multifaceted, university-wide initiative to boost political learning, engagement, and voting in that year’s presidential election—and beyond. Spearheaded by Tisch College with support from the Office of the Provost, there are JumboVote representatives in every Tufts school and major administrative department, as well as among the student body. The initiative worked to facilitate voter registration, tackle barriers for Tufts students to vote in local communities, increase voter education, and support events and programs that foster political engagement. In 2018 JumboVote surpassed its 2016 success, and JumboVote is currently preparing for the 2020 election. Access the 2018 JumboVote Resource folder! This folder includes tips on registering to vote or requesting an absentee ballot application online through tufts.turbovote.org . It also includes a spreadsheet of the important deadlines for voting by absentee ballot. If you are looking for the correct legal address for your residence hall, or where you should vote if you live on campus, the folder has that information as well. Check out the folder here! We are committed to not just replicating, but surpassing JumboVote's past successes in 2016 and 2018, with the goal of reversing historical trends of low student turnout in midterm elections. We are recruiting volunteers! 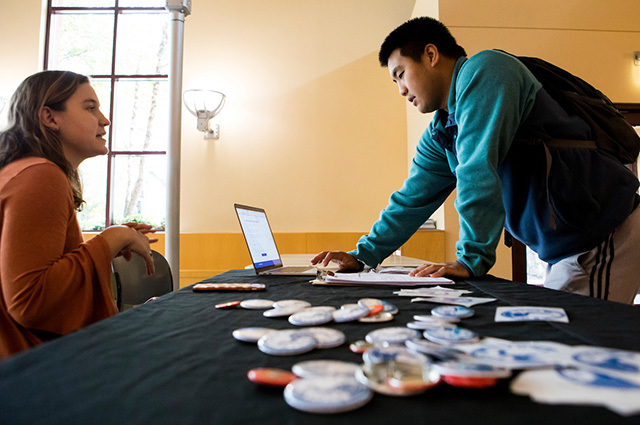 JumboVote students help stage voter registration drives in the dining halls and visible areas of campus, organize events related to voter issues, drive students to the polls on election day, and even monitor the polls to protect student voting. Email the JumboVote coordinator, Peter de Guzman, at peter.de_guzman@tufts.edu for more information. For more information, email jumbovote@tufts.edu. You can also follow JumboVote on Facebook and Twitter! All members of the Tufts community—students, staff, and faculty—can sign up through TurboVote and register to vote, check their status, receive election reminders, and more. Students can register to vote in Massachusetts or in their home state. Tufts has released the results of its own participation in Tisch College's National Study of Learning, Voting and Engagement (NSLVE).